The three mountain ranges that cross much of contemporary Morocco—the Middle in the north, the High Atlas in central Morocco, and the Anti-Atlas in the south along the Atlantic coast—form both a natural boundary and a rich natural environment. Stretching from the extreme southwest of the country to the northeast coast, they form a major part of the region’s landscape, and as such have affected settlement patterns, trade routes, and environmental relationships. Strung diagonally across Morocco, the three ranges trap incoming vents of air and precipitation off the Atlantic coast, forcing them northward towards the Mediterranean coast. As a result, the northern slopes of the mountains have a more humid, temperate environment, while the southern slopes are arid and have a harsher climate. The northern slopes are most humid between early fall and late spring, and though rainfall is irregular, it can occasionally fall torrentially, making the mountain passes treacherous for travelers. The ranges cover nearly 100,000 km2, and average around 2,000 m above sea level. 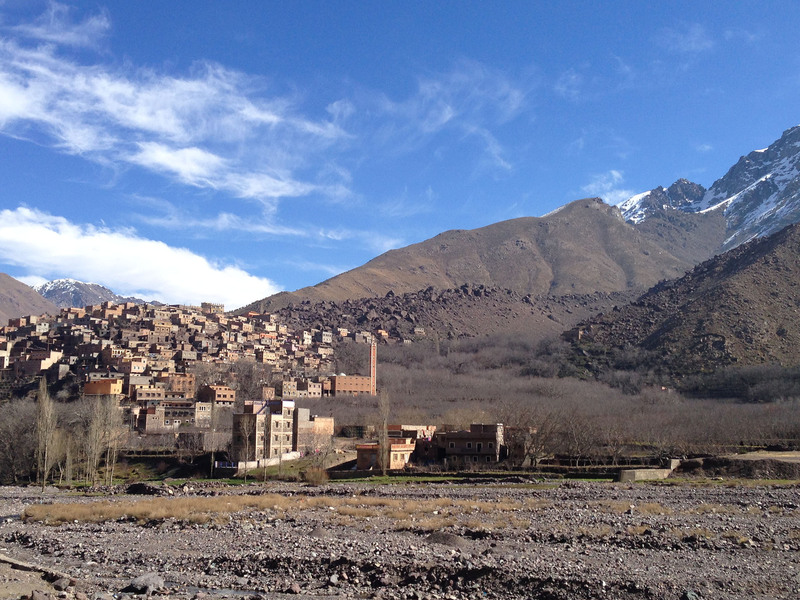 Jbel Toubkal, the highest mountain in the Atlas range, reaches a height of 4,167 m and remains covered in snow for much of the year. Traversing the Atlas most often required going through one of two passes: the southern pass through the High Atlas between Marrakesh and Ouarzazate, or the northern pass over the Middle Atlas between Sijilmasa and Fez. Controlling either of these routes, or ideally both of them, secured access to the lucrative trade of gold and salt between the Mediterranean and sub-Saharan Africa. These extreme variations in climate have prompted the mountains’ inhabitants to practice seasonal migration, moving between the lower hills and plains on the northern side of the mountains and the higher peaks. Evidence of such transhumant practice is present as early as the eighth century CE, practiced by the Zenāta clans in the Middle Atlas, the Maṣmūda in the High Atlas, and the Ṣanhāja along the southern sides of both ranges. At the end of the humid season, which occurred sometime between late April and early May, the tribal leader would signal the move from the lower elevations to higher climes. Territories were divided between clan or familial groups that left their more permanent settlements on the plains for an itinerant season of herding and grazing. Since these seasonal movements often traversed other tribal territories, they became a major driver in forming political alliances. During the more humid season, which extended from early October to late March, the highland plains were used for herding, following a practice developed among the Berber communities centered around the agdal. Though as a garden type the agdal would be monumentalized on an imperial scale under the Almohads in twelfth-century Marrakesh (see Agdal Garden), on the rural scale, these walled agropastoral enclosures were popular throughout the Atlas both before and after their heyday in the medieval era. Meant to regulate resource consumption, the agdals were monitored by councils of herdsmen, who, upon returning to the plains in the spring, prohibited the use of the agdals for grazing (though surrounding areas were open to use). Through this enforced restriction, plots of land were preserved for the later part of the summer, typically very hot and dry, when resources were at their scarcest. In late October, the agdals were left to go fallow and recover from the season’s grazing. Photograph courtesy Abbey Stockstill, ca. 2014. Basset, R. Mélanges René Basset: études nord-africaines et orientales. Paris: E. Leroux, 1923. Boone, J. L., J. E. Myers, and C. L. Redman. “Archeological and Historical Approaches to Complex Societies: The Islamic States of Medieval Morocco.” American Anthropologist 92, no. 3 (1990): 630–46. Célérier, J. “La transhumance dans le Moyen Atlas.” Hespéris 7 (1927): 53–68. Domínguez Gregorio, P. “Vers l’éco-anthropologie. Une approche multidisciplinaire de l’agdal pastoral du Yagour (haut atlas de Marrakech).” Doctoral dissertation, Universitat Autònoma de Barcelona, 2011. http://hdl.handle.net/10803/79093. Harris, W. Tafilet; the Narrative of a Journey of Exploration in the Atlas Mountains and the Oases of the North-West Sahara. Edinburgh: W. Blackwood and Sons, 1895. http://catalog.hathitrust.org/Record/001609145.